The point of this game is to rush to BH6 as quickly as possible, pretty much putting off most upgrades until after we cross the BH6 upgrade off the list. At BH4, we had a few extra days while I was upgrading to my preferred troop, the Beta Minion. 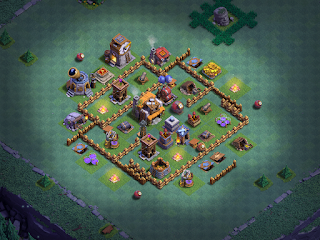 7 upgraded levels later, several of the key defenses were at level 3. And that's where they'll likely stay until the game reaches BH6. The only upgrades required at BH5 will be resource storages; I'll probably grab one or two of the new defenses and boost them to level 3, but as soon as I can upgrade the BH to level 6, that's what I'll do. When the upgrade finished, the game was at about 1650 trophies or thereabouts; right now it is at 1835. Even though the game is running at low trophies, I'm matching up to players with stronger defenses and troops. This is to be expected - matchmaking is primarily trophy based at this point and there are a lot of players that are further along. My expectation for this game is that I maintain a roughly 50:50 win:loss ratio as I hyper-rush...and that's where the game sits. Rushing - strategic or hyper - or maxing/near-maxing, you've got to keep realistic expectations about your progress in the game. The reality is that all roads lead to Rome, it's just how fast you go to get there and whether you're ready to enter the Coliseum or need a little bit to forge your steel. My standard rush is a bit more conservative; I like to max BH4, take defensive structures to level 5 at BH5 as well as both Beta Minions and Baby Dragons to level 10, and THEN upgrade to BH6. I feel having some stronger defenses and troops going into BH6 makes the game more playable. Each to his or her own; either way will work fine. I anticipate upgrading the storages this week and possibly pulling the pin on the BH6 upgrade this weekend. In any case, the BH6 upgrade will be here by end of next week at the latest. And if you don't mind - hit LIKE and Subscribe while you're at it. I'm trying to build the channel and turn this into a way of supporting myself!